In July, three sheets to the wind, in a very hot beer garden, the phrase "We should go to Iceland" was uttered. Bit outlandish. Unsure whether it was going to be taken seriously. But then five months later, a group of us find ourselves standing by the sea, looking at this mountain and I can't decide whether there are faces in it or whether the cube of fermented shark I had eaten a few hours earlier had hallucinogenic properties. There is no way of describing what fermented shark tastes like that truly gets across the horror. My tips are: go for the smallest piece and don't sniff it before putting it into your mouth. Ammonia is the first wave, Stilton-esque tang sans the creaminess will follow, and then you try not to retch at the chewy dead flesh mouthfeel you have going on in there. A further tip, is not to wash your mouth out with tea. Hot tea will make it worse. Am I glad I ate it? Yes. Will I eat it again. Heck no. Iceland is insanely beautiful. 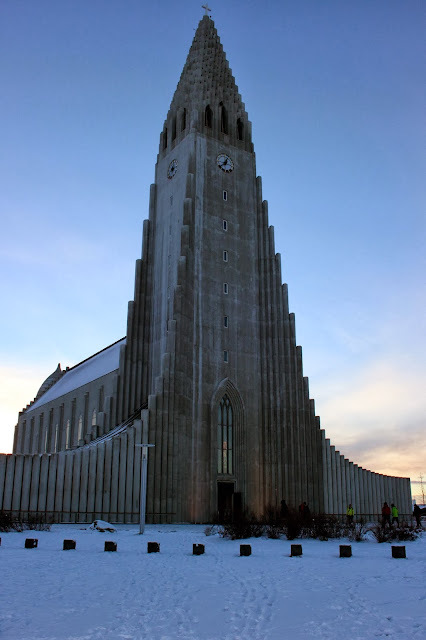 Take a wander up to Hallgrímskirkja, the largest church in Iceland. Tickets to the top are 700kr (roughly about £3.50). The above photo was taken at around midday, the sun doesn't really rise much and sets super early in December. Opposite the church is an innocuous looking little cafe called Cafe Loki (Lokastigur 28, Reykjavik 101). Whilst here the ill-fated shark incident took place it is reasonably well priced and offers traditional Icelandic food, a bit of a breather from all of the burgers in the city centre. 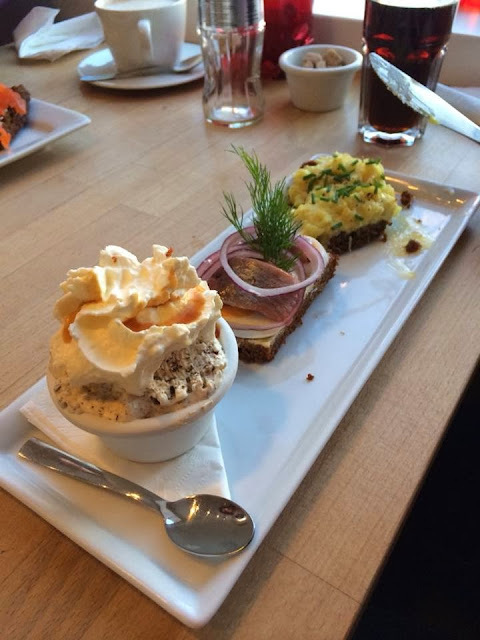 They serve "Icelandic plates" which have cured herring and rich rye bread on them as well as rye bread ice cream which was delicious. Also, a bowl of their meat soup will defrost away all of your chilly bits. Talking of burgers, there are a lot of burgers. 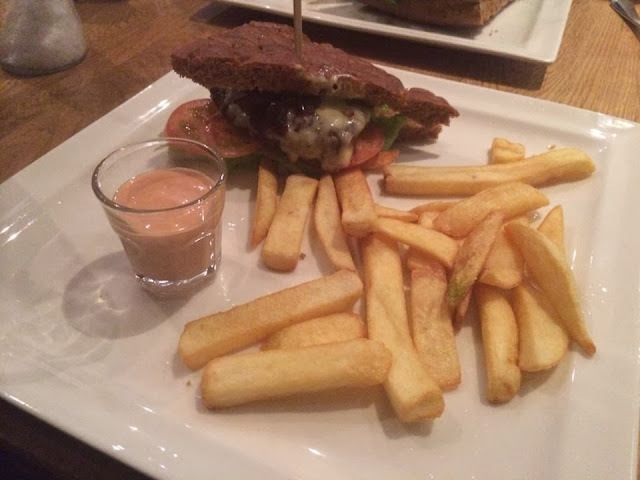 The Scandi burger at the Scandinavian (Laugavegur 22, Reykjavik 101) was good but if the seafood soup is on the menu, get one. Amazing soup. Our hotel, Hotel Fron, was attached to it and you get a complimentary 20% of drinks there. The buffet breakfast for the hotel is also served in the restaurant. 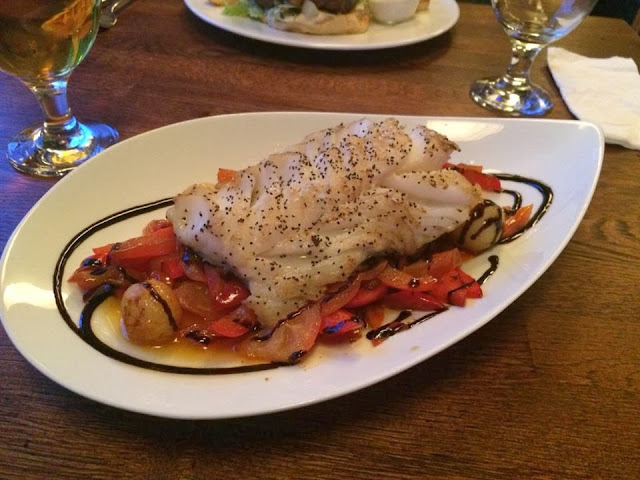 Other stuff I ate includes the melt in the mouth cod from Restaurant 73. 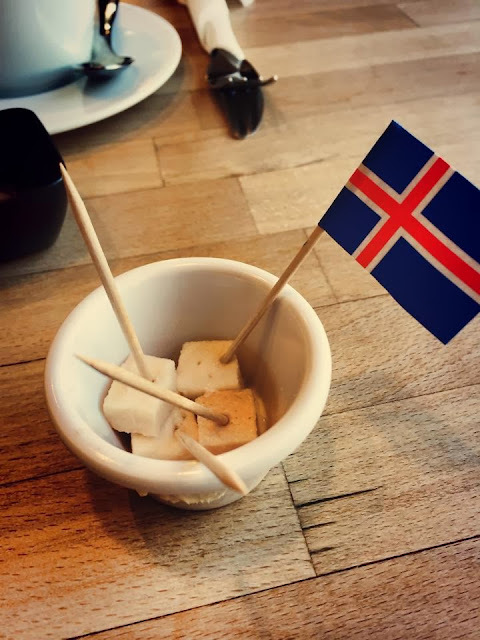 (Laugavegur 73, Reykjavik 101). The waiter was great too. He pointed out where we should watch for the snow sliding off the roof opposite and onto the people walking below. And after that cod, we found a bakery. 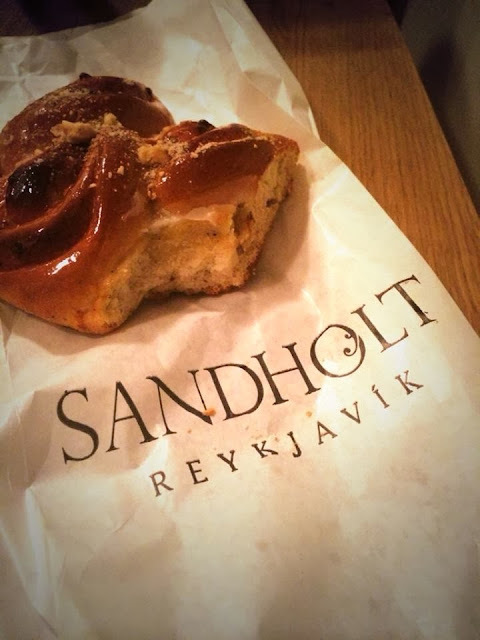 Sandholt Bakery (Bakari Sandholt, Laugavegur 36, Reykjavik 101). Eat the macarons. All of the macarons. Hot dogs are a thing. People say this is the best place to get hot dogs in Europe. (Also, prepare yourself for a photo of me rubbing a hot dog in my face). I ate two. What you can't see is the magic hiding underneath. The crispy onions. The cronions. Get one with the full works. (Get ready for hot dog face). But the best bit of the whole trip was this. The Northern Lights. I can't wait to go back.